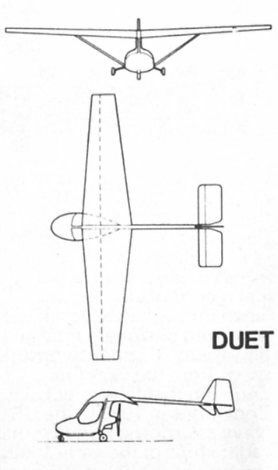 Although it falls within the new CAA microlight definition because of its weight, the Duet two-seat light aircraft has many features of the modern conventional light aircraft. This “pod and boom”-style aircraft, ДальшеMore>>> with its side-by-side seating and tricycle gear with steerable nose-wheel, has been designed largely to the normal CAA light aircraft airworthiness standards (BCAR Section K). In addition, it has normal three-axis controls, including spoilers for roll control. The structure is largely glassfibre, with the fuselage pod moulded in two halves. 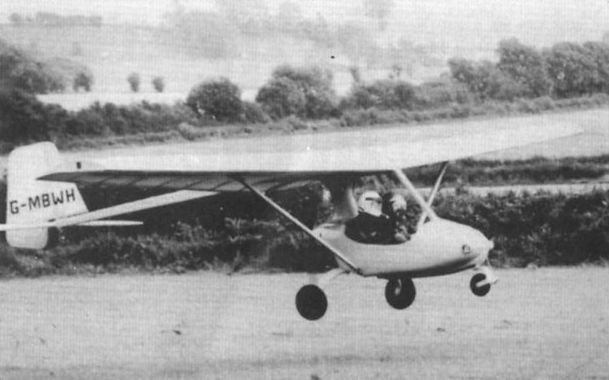 The wings are fabric-covered and the whole aircraft de-rigs like a modern glider. The wings and tailplane are removable for stowage on a trailer, and it is claimed that the Duet can be rigged in about 15min. The Duet first flew last summer, and the prototype has been flying with the well-tried 32 h.p. Cayuna (with 2:1 reduction gear), though it is being tested with several different types of engine. Designability, the UK-based firm of design consultants, was responsible for the design of the Duet. Static tests of the aircraft’s structure have included testing ten wing spars to destruction, and the wing is known to be good for at least 5g. Although the company originally proposed to put the Duet into production, the work has now been subcontracted to Jordan Aviation of Seaside Road, St Leonards-on-Sea, East Sussex TN38 0AL, to whom all enquiries concerning the Duet should be directed. Arrangements are being made for the Duet to be available for demonstration during January. Jordan Aviation quote a price of ?3,200 Plus VAT for a complete aircraft, and also supply a basic trailer at ?250 plus VAT. Max rough air speed 60 m.p.h. Measured full-throttle level flight speed at design AUW 58 m.p.h.